As it becomes apparent that the adoption of new process nodes has been significantly slowed down due to availability and cost of next generation FEOL lithography technologies, it becomes ever more important that the continuation of cost reductions and functionality improvements that have driven the growth of the Semiconductor industry over the last 40 years be sought elsewhere. Some of the investment heretofore focused on the FEOL “bleeding edge” technology should now be refocused more in BEOL Photo resist lithography for packing where the lower hanging fruit lies. This will require simplification of processes and reduction in material costs wherever possible while at the same time improving process control, yields and functionality and reducing photo resist processing tool costs. One way to reduce costs is by substantially reducing waste in photolithographic processing technology. It has long been noted by just about anyone who performs spin processing on Photoresist Track equipment that there is an enormous amount of waste in the process as most of the Photoresist material consumed in the process is actually thrown off the wafer during the spin process and wasted. Textbooks in disusing the process point out the wastefulness of the process. The waste becomes especially meaningful in BEOL WLCSP, 2.5D and 3D processing where thicker resist films need to be cast. Multiple spins to achieve the film thickness required exacerbates the waste, while increasing Photoresist viscosity so that the thicker films can be cast adds substantially to equipment costs as the pumps required to pump the material can cost well into the 5 figures in US Dollars. Multiple spins also require more Photoresist track equipment for multiple trips through the equipment. The high viscosities also make elimination of bubbles a constant struggle further increasing costs. The film is formed during the spin process and then baked typically on a hot plate to remove additional solvent to render the film stable and photo definable. All of the foregoing tends to substantially increase photo resist processing costs in the Back End of the Line (BEOL) lithography for Wafer level Chip Scale Packaging (WLCSP). Another avenue is to use expensive chemically amplified resist (CAR) systems, which have the effect of improving CD control and aspect ratio’s in a single coat, however further increasing material cost substantially. 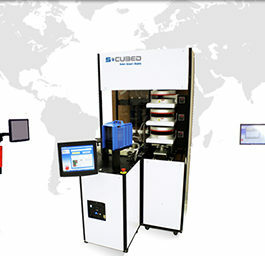 The engineers at S-Cubed™ have invented a new process…FastSpin™ that addresses all of these cost/complexity issues. In the new process (patents applied for) the film is not cast so much as wet formed by spinning the wafer under exquisite servo control for a very short time, subsequently processed to render the film stable and photo definable. The wet film is maintained in the wet state and is allowed to level, allowing for planar coatings over topography. The process not only substantially reduces photo resist consumption for both standard and CAR resists, it also substantially reduces the cost of the photo resist processing tools, Photo resist track, by reducing the number of spin processors required for a given spin processor tool throughput.